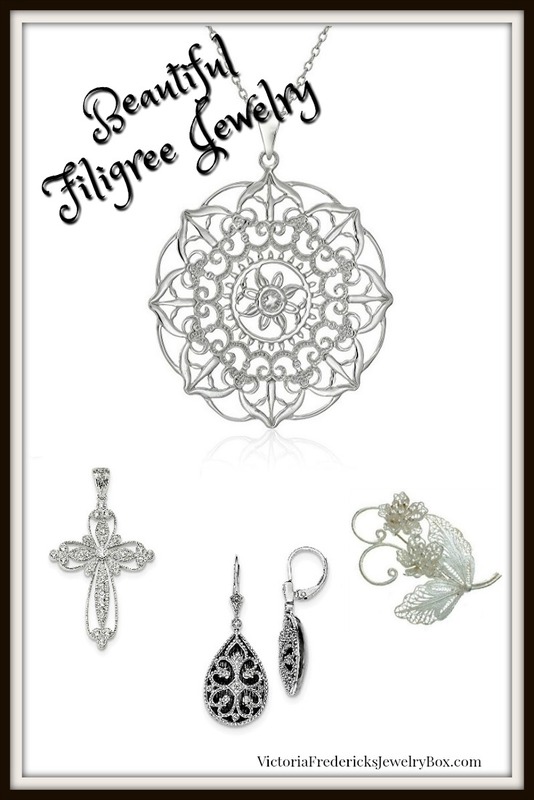 Delicate filigree silver jewelry is quite lovely. 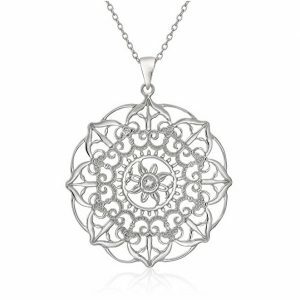 Silver jewelry is very popular now, and filigree silver is elegant and stylish. Just right for today’s woman. And what, specifically, is filigree silver jewelry, you ask? Well, as you can see from the pendant featured here, it has a look similar to lace–a very delicate type of metalwork. You’ll often see tiny beads or twisted threads used in this style, or a combination of both. This “lacy” look is created by soldering the pieces together or on another metal surface, creating a unique, detailed look. This affordable, timeless beauty features an intricate design, accented with sparkling CZ crystals. You would want to display this gorgeous pendant on a delicate chain purchased separately. Wear it day or night, with any type of outfit. It will catch the light and certainly people’s eyes, so they’ll probably want a closer look at the beautiful detail. Filigree work in precious metals has been used as decoration since ancient times – samples have been found in ancient civilizations such as Egypt and China. Other ancient civilizations that extensively used filigree were the Moors, the Greeks, ancient Celts and Indians. Modern countries who continue to use filigree are Mexico, India and some Scandinavian countries. The ability to work in fine filigree was used as a gauge on how skilled a jeweler was – the finer his work the more money he could charge. Many filigree pieces were made so a fragrance could be added to a container and the mesh would allow the fragrance to disperse – used a lot in jewelry in medieval, Victorian and Edwardian days when the stench of the streets could be over powering. Women especially wore a filigree pendant with their favorite fragrance that they smell any time. The filigree design is most often seen in drop earrings since they are larger and will provide enough room for the lacy design. These sterling silver earrings are made even more stunning with the addition of 10 small, round diamonds. Vintage style is certainly very popular and these earrings are definitely reminiscent of bygone eras. No doubt these shimmering, dangling earrings will look stunning paired with an evening outfit. Cuff bracelets are popular because the are easy to slip on quickly since there are no clasps to lock into place. The beautiful vine design in this cuff really adds to its interest and shine. It looks gorgeous on its own, or you can stack it with other bangles and bracelets for a really eye-catching look. This is a very versatile piece that looks great with any outfit. Therefore, it makes a wonderful gift, either for yourself or for that special someone. Wear just a touch of filigree or go big with this style — your choice with a variety of bracelets and cuffs. Regardless of whether you prefer a heavier design or a more delicate look, there is a cuff bracelet available to fit you personal preference. This delicate, very unique piece really packs a shimmer and shine, so she’s sure to love it if this is a gift you are seeking. Or, why not treat yourself to a beautiful pin to accessorize your own outfits? I love the use of the filigree work in this piece. The leaves are gorgeous and make an exceptional brooch design. Whether it’s to set against a dark-colored top, to fasten a scarf or to add that extra sparkle to a jacket or dress, it truly is a lovely multipurpose accessory.